The Blackfoot Papers are a four volume set of books recounting the history and rich cultural heritage of the Pikunni Indian Tribe in Montana. Available individually or as a complete set. The Blackfeet Reservation was owned by the tribe in common until 1907-1908 when land parcels were made to the Blackfeet people. This book was compiled in 1980 of the names of the people who received those allotments. It also tells their blood degree and extended family members. Great for family research. 288 pages. Les Carpenter wrote this book while teaching natural history in Browning. It is designed to introduce students to the geology, climate, and ecology of the Reservation and its environs. It is a meaningful addition to knowledge of earth science and biology of north central Montana. Hardback, 95 Pages. This coloring/activity book gives the Blackfeet and English names for 16 common animals. There is a coloring page for each animal and a page to write a story of each. Ghost stories are remembered and told by six Blackfeet. These stories reinforce Blackfeet beliefs, explain events that were forewarned, linked the known with the unknown, and perhaps provided social control, or entertainment. 47 Pages. During her lifetime, Mary Ground, whose Indian name is Grass Woman, experienced extreme changes in the life of the Blackfeet tribe. She lived to be 107 and her memories bridged two centuries. In the book she relates 14 different stories or episodes she heard of or participated in while a young girl. 64 Pages. Author Dan Gilham, Sr. worked in law enforce most of his life, serving as a judge when he wrote this book in 1979. He explains tribal laws of that time and the consequences of their violations. 71 Pages. All Blackfeet knew Napi, from the serious side of his creations to the foolish and spiteful deeds he performed. Napi stories have been passed down from generation to generation teaching a lesson or explaining how part of nature came to be. This is a selection of those stories giving more insight into the Blackfeet people. 35 pages. Tom Many Guns was born in 1894. His stories bring out the rich cultural heritage of the Blackfeet that have been preserved through oral traditions. He tells of his early life and retells stories told to him by the elders. A map of Blackfeet territory and landmarks with their Blackfeet names with translations is included. 67 pages. Nell Kipp frequently disagrees with history books’ accounts as she writes of the history of the Red Man. She also describes native ways, contributions, religion, and societies with emphasis on the Blackfeet. 47 pages. George Comes At Night retells old time stories from his father, who was born in 1858. Blackfeet way of life, values, traditions, ceremonies, societies, and the extent of historical occupation of the land are mixed in the tales. Also included is First Rider’s account on the Baker Massacre. 67 pages. James Willard Schultz recorded stories told to him by the Blackfeet. Two of those stories are in this 24 page booklet. Running Eagle is about Pi'tamaka a successful woman warrior of the Blackfeet. The Cause of Things is the legend of the origin of the Blackfeet Indians and the clans. 24 pages. Five essays on Blackfeet history were written in 1978 by young future Blackfeet leaders. Their purpose was to further the understanding of the Blackfeet Tribe. 33 pages. George Peterson was born in Browning in 1924. He grew up on the open range to become a saddle-bronc rider, musician, WWII navy veteran, poet and building contractor throughout the USA. These are a collection of some of his funny poems about reservation life cleverly illustrated by Gerald Trombley. 40 pages. A series of illustrated books written to help preserve the culture and heritage of the four bands that make up the Blackfoot Confederacy in the United States and Canada. 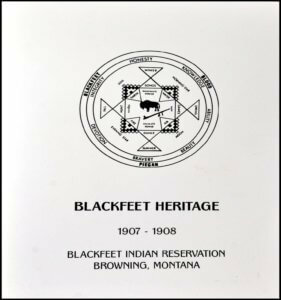 A Blackfeet perspective on the history of education from the Mission schools includes interviews with Blackfeet elders who attended the early schools. Included are sections on Reservation All Blackfeet Schools, Boarding Schools, private and public schools, maps and, copies of old photographs. 40 pages.